Walking through The Gasparilla Inn’s pillared entrance and into the lobby, you experience the feeling of Florida as it was meant to be. Guests are instantly embraced with the tranquil civility of a time that once was -- and still is -- at this classic resort. At the same time, you realize that activity and fun abound, from a championship Pete Dye Golf Course to a 250-slip marina that is home base for the best tarpon fishing in the world. The Gasparilla Inn & Club has been a premier destination on Florida’s Gulf Coast since 1913. It offers 137 rooms, suites, and cottages in a pristine environment at the tip of Boca Grande Island. Owned by the William S. Farish Jr. family, The Inn has played host to many notables throughout its storied history, including Henry Ford, Harvey Firestone, Thomas Edison, Katharine Hepburn, the George H.W. Bush family as well as members of the duPont family. Built originally to appeal to wealthy Northerners who could go anywhere, The Inn is the center of village life on the island. 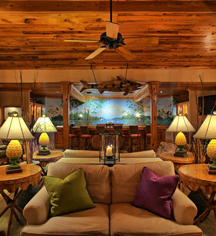 It offers separate golf and beach club memberships, as well as the hospitality of The Inn, itself. 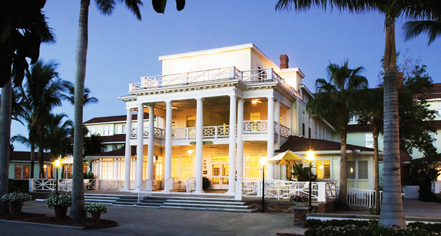 The Gasparilla Inn & Club, a member of Historic Hotels of America since 2007, dates back to 1913. Gasparilla takes its name from the legendary Spanish pirate Jose Gaspar, who reputedly plundered the surrounding waters in the 18th century. Cancellation Policy: Changes according to season. Please contact hotel for more information. Occupancy Restrictions: Varies by room type. The largest unit available on-property can accommodate eight (8) people without extra amenities. Transportation: Golf carts and bikes provided around property. Walking through The Gasparilla Inn’s pillared entrance and into the lobby, you experience the feeling of Florida as it was meant to be. Guests are instantly embraced with the tranquil civility of a time that once was -- and still is -- at this classic resort. Learn more about the History of The Gasparilla Inn & Club .